Please note: We do not and will not give out your information to third parties. Just write us an email at the address above. If you have spotted new coins at any Walt Disney World theme park, resort, etc. then please contact us! We would greatly appreciate any reports we get about new coins. Your reports will allow us to post information about these new coins in our News Blog. 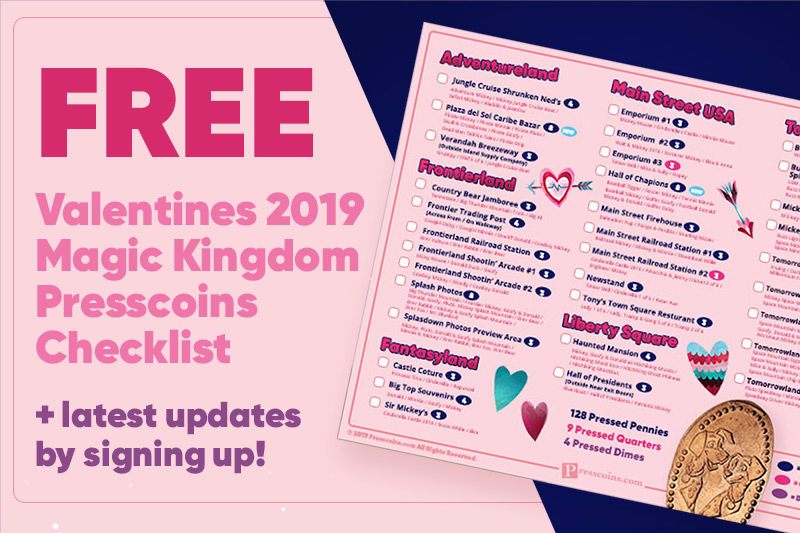 This will benefit other users by keeping them informed about the latest Walt Disney World pressed coins as quickly as possible. If you know of any machines that have been removed, currently off-stage or unavailable due to construction, please let us know about them. With these reports we will be able to post something about these machines in our News Blog. This will help users planning to visit Walt Disney World by letting them know the current status of any particular machine. Our Walt Disney World pressed coin database is constantly changing and still needs a lot of work to document some of the old, prototypes, never on stage and design variations. It is our goal to document as much as possible every known coin that has been available to guests, Disney Castmembers, special events, etc. at Walt Disney World. If you could provide us with any additional information about any of these types of coins including pictures, locations, etc. it would be greatly appreciated. Information that you have may help us figure out where some coins came from and what coins are still missing from our database. We do make mistakes. If you notice any problems with our web site, or in our listings, please let us know about it. Hopefully, we will be able to fix any problems as fast as possible. However, keep in mind that our web site was designed to work with the latest and more popular web browsers. If you are using a very old web browser, or using something other than Internet Explorer, Firefox or Safari, then you could experience a problem displaying some of the special features of our web site. If you are contacting us about a technical problem with our web site, please tell us a little bit about what computer, operating system and web browser you are using. We have had people accessing our web site using Windows 3.1 with a very old Internet Explorer and we’ve had people using an Apple iPhone. We’re sorry, but we don’t have the capability to test everything that is currently available to use the Internet. ** Please Note: We currently do not sell any coins, so we ask that you do not email us asking us to sell you something. We do occasionally buy older coins for ourselves to replace some of the ones we have. If you see an image of a zinc coin on our web site, then most likely that is due to us not having access to a copper coin to make an image of. If you have any older coins that are not listed on our web site, then we would really be interested in seeing and hearing about what you have.